The first round of the French Presidential elections is due to be held in 17 days (on 23rd April), with the likely second round two weeks later on 7th May. The eleven presidential candidates yesterday took part in the final televised debate before the first round. Weighing their performances remains fraught with difficulty and the key question remains whether the centre-left candidate Emmanuel Macron and National Front leader Marine Le Pen are still likely to make it to the second round. This in-depth four-part Election Series examines all core elements of the upcoming presidential and legislative elections and takes a quantitative and qualitative approach. Q1: At this stage can we predict with any accuracy the eventual winner? The media would suggest that we cannot and there is certainly scope for surprises. At the very least opinion polls could be under or over-estimating candidates’ chances. But if Macron and Le Pen make it to the second round, Macron looks set to be elected President based on opinion polls. Q2: Are French presidential opinion polls reliable? They accurately predicted the outcome of the 2012 and 2007 presidential elections and the eventual winner of the 2002 election. But opinion polls under-estimated support for Jean-Marie Le Pen in the first round in 2002. Q3: What are French opinion polls currently predicting? Macron and Le Pen are neck and neck in the first round on about 25% but these polls do not account for undecided voters and turnout. Q4: Do French regional elections tell us anything about candidates’ chances? The December 2015 regional elections suggest that while Marine Le Pen will do well in the first round, she will struggle in the second round in the face of concerted political opposition. Q5: What are the odds of a left-wing candidate becoming President? While Mélenchon is likely to come a credible fourth, based on current opinion polls, neither him nor Socialist Party candidate Hamon are likely to get even close to making it to the second round. Why are French presidential elections important? How are French presidential elections run? What are the key themes for this presidential election? Why are French legislative elections important? What are the odds of a candidate winning an absolute majority in the first round? Does the number of sponsors have a bearing on first round results? Does the number of candidates have a bearing on first round results? Does the first round result have a bearing on the outcome of the second round? Does it matter who came third or fourth in the first round? At this stage can we predict with any accuracy the eventual winner? 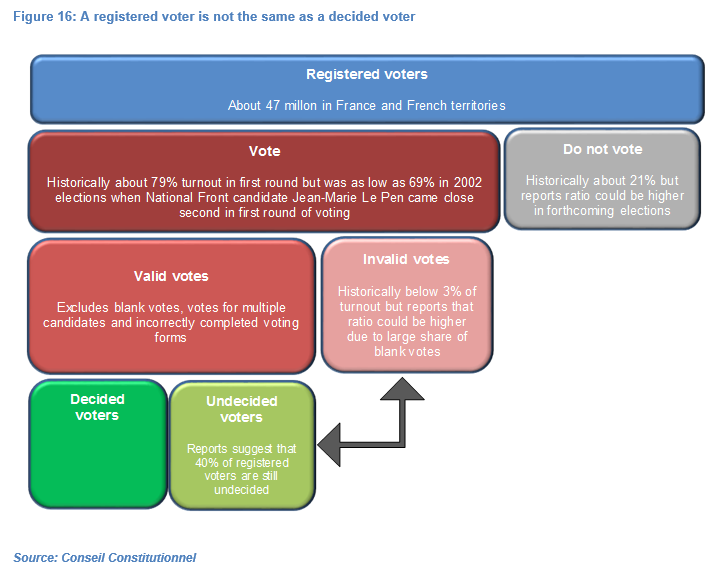 Are French presidential opinion polls reliable? What are French opinion polls currently predicting? Do French regional elections tell us anything about candidates’ chances? What are the odds of a left-wing candidate becoming President? What are the possible implications for the future of the eurozone and EU? Who will be Prime Minister and why is this important? 1. AT THIS STAGE CAN WE PREDICT WITH ANY ACCURACY THE EVENTUAL WINNER? The first round of the French Presidential elections is due to be held in 17 days (on 23rd April), with the likely second round two weeks later on 7th May. 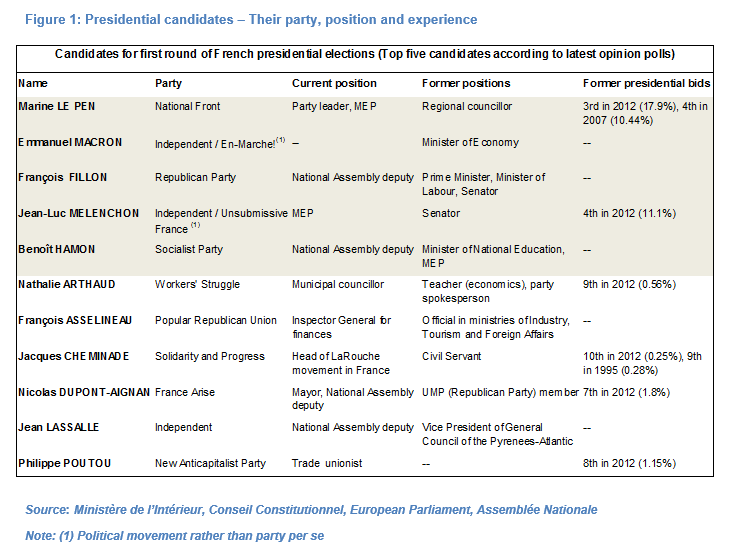 Eleven candidates, spanning the breadth of the political spectrum, will officially contest the first round in a bid to capture the 47 million or so votes up for grabs, as detailed in The Ultimate Guide to the 2017 French Elections – Part I (7 March 2017) and Figure 1. The centre-left independent candidate Emmanuel Macron and National Front leader Marine Le Pen are still neck-to-neck in the polls on around 25% each, although support for Le Pen has somewhat eroded in recent days. They are still comfortably ahead of Republican Party nominee François Fillon whose support has failed to breach 20% (see Figure 2). Popular support for the far-left candidate Jean-Luc Mélenchon continues to grind higher (15%) and he is now well ahead of the Socialist Party’s Benoît Hamon. 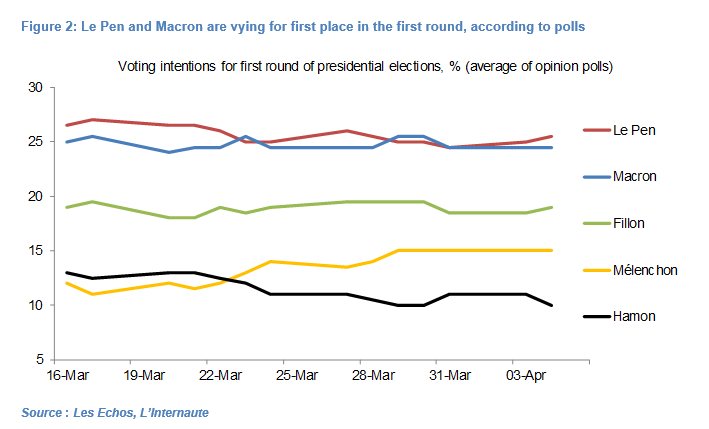 Previous elections suggest there is scope for a “surprise” in the first round and certainly for candidates to outperform/underperform relative to the polls, even if Le Pen and Macron still look on track to fill the top two spots in my view. In the 2002 elections opinion polls under-estimated support for National Front founder Jean-Marie Le Pen who came a close second behind incumbent President Chirac. Moreover, in four of the previous six presidential elections (1981, 1985, 2002 and 2012) the incumbent president ran for re-election and in each instance made it to the second round. This pattern made it somewhat easier to predict at least who would fill the top two spots in the first round. But President Hollande has opted not to run for a second term – the first time for an incumbent President since the 1974 elections. This has arguably contributed to a more open field, with five candidates polling 10% or more in the first round (see Figure 2). 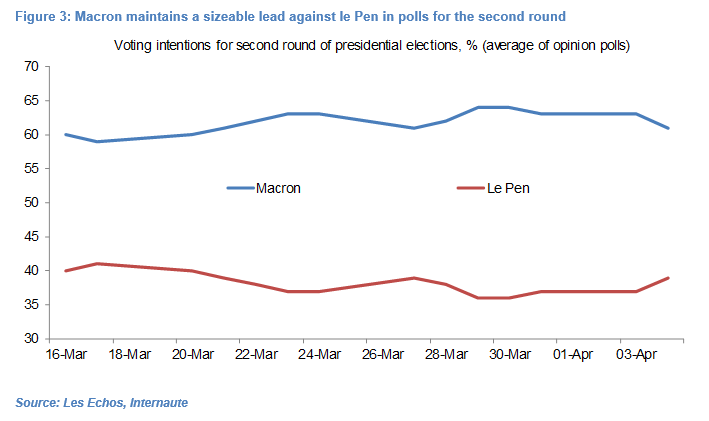 Importantly, Macron still leads Le Pen by a sizeable 22 percentage points in second round polls (see Figure 3) which in the previous three presidential elections proved reliable guides. Prior elections have admittedly thrown up several surprises, with the winners of the first round in the 1974, 1981 and 1995 elections losing in the second round and highlighting the importance of “tactical” voting. Macron’s margin of victory will in any case likely depend, amongst other factors, on voter turnout, the prevalence of blank votes and how undecided voters swing. But these four prior elections had been reasonably close-fought affairs with none of the candidates enjoying the kind of lead which Macron currently has in the polls. Macron only needs to win 50.1% (or more) to win so while Le Pen could win, current polls suggest that she will not. On the surface, at least, the outcome of these elections is perhaps a little more straightforward than the media and political commentators would suggest. 2. ARE FRENCH PRESIDENTIAL OPINION POLLS RELIABLE? 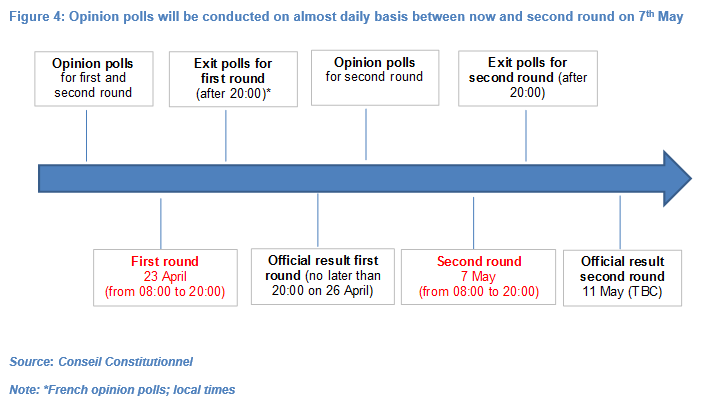 Exit polls for the second round – to be conducted no earlier than 20:00 on 7 May. Opinion polls’ reliability in predicting election outcomes has come under much scrutiny following Donald Trump’s victory in the US presidential elections in November, the “leave” vote in last June’s UK referendum on EU membership and the Conservative Party’s majority-win in the May 2015 British general elections. This very issue came to the fore in France 15 years ago. In the first round of the 2002 French presidential elections, opinion polls had Socialist candidate Lionel Jospin beating National Front candidate Jean-Marie Le Pen by 4.5 percentage points to second place. But it was Le Pen who made it to the second round, beating Jospin by 0.7 percentage points – the first time in France’s history that a far-right candidate had made it to the run-off stage of a presidential election (see green box in Figure 5). The very low voter turnout (71.6%) and meek support for President Chirac, a mainstream candidate, partly reflected popular discontent with his presidency while Le Pen’s strong showing echoed a popular desire for more right-wing policies – in effect a protest-vote against the status quo. Opinion polls failed to accurately capture both the low turnout of undecided voters who had been more likely to support a mainstream candidate (Chirac and Jospin) and the fact that some of those polled were reluctant to admit supporting a far-right candidate (Jean-Marie Le Pen). However, opinion polls conducted after the first round of the 2002 presidential elections correctly predicted that Chirac would beat Jean-Marie Le Pen by a very large margin (about 56 percentage points) in the second round run-off. Chirac won a massive 82.2% of the vote (vs 17.8% for Le Pen) on a far higher voter turnout of 79.7% – the largest ever margin of victory in a presidential election under the Fifth Republic. The share of support for Le Pen was broadly unchanged from the first round – the first time ever for a presidential candidate – as a result of two factors. First, the majority of those who voted for neither Chirac nor Le Pen in the first round voted for Chirac in the second. Also, some of those who voted Le Pen in a first round “protest vote” either switched their support to Chirac or did not vote at all in the second round. In essence, the French electorate were simply not willing to elect as President a controversial extreme-right candidate, regardless of their misgivings about Chirac. Moreover, in the past two presidential elections, opinion polls predicted with reasonable accuracy the share of votes won by the top four finishers in the first round and importantly the winner of the second round (see Figure 6). 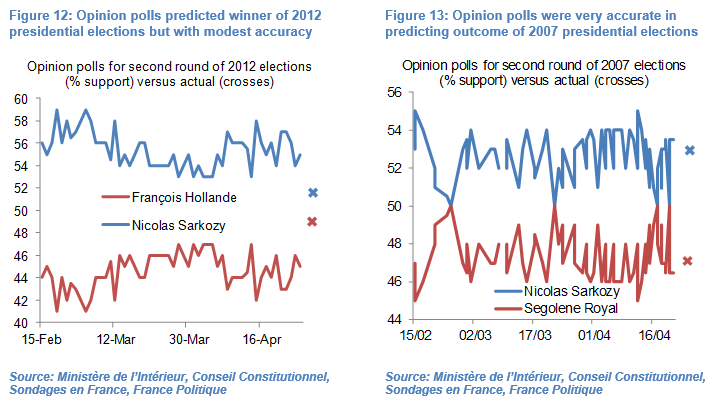 Opinion polls held in the ten weeks before the first round of the 2012 elections were pretty volatile, with François Hollande and Nicolas Sarkozy vying for first place (see Figure 7). On average, however, during that period polls had Hollande beating Sarkozy by 1.3 percentage points – bang in line with the actual outcome of a 1.4 percentage gap. 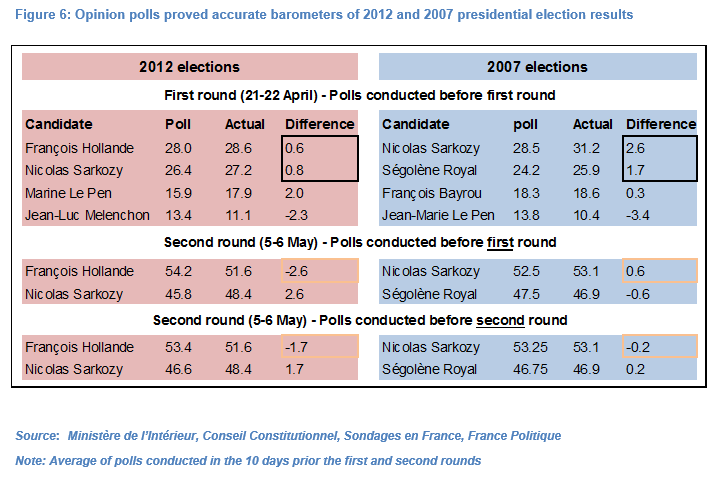 Moreover, no poll held in the ten days up to the first round had Sarkozy coming first in the first round. 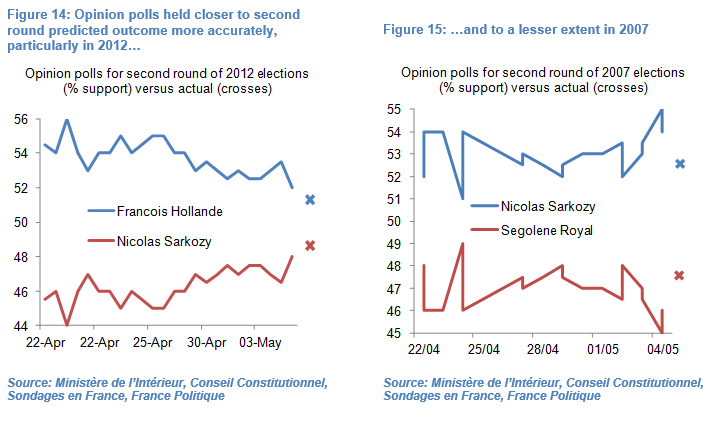 Opinion polls held in the ten weeks before the 2007 elections correctly had Nicolas Sarkozy and Ségolène Royal coming first and second respectively in the first round on 21-22 April (see Figure 8). 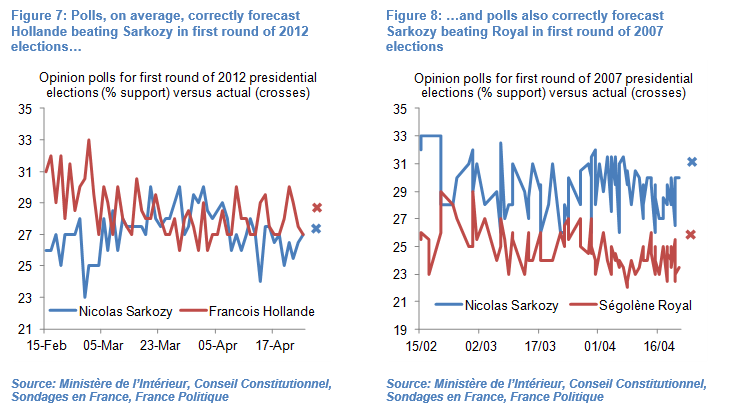 Moreover opinion polls on average had Sarkozy beating Royal by 4.5 percentage points – very close to the actual outcome (Sarkozy beat Royal by 5.3 percentage points). Only one opinion poll – held two months before the first round – had Royal beating Sarkozy to first place and by only one percentage point. Opinion polls also correctly anticipated who would come third and fourth respectively in the 2012 elections (Marine Le Pen and Jean-Luc Mélenchon) and 2007 elections (François Bayrou and Jean-Marie Le Pen). However, opinion polls were not quite as accurate in predicting their shares of the popular vote as they were for the first and second place finishers. In particular Jean-Marie Le Pen fared worse than predicted in 2007 which saw a high voter turnout of 82.6% (see Figure 10). Conversely, his daughter Marine Le Pen won a slightly higher share of the popular vote in the first round of the 2012 elections (17.9%) than polls had suggested (about 16%), as per Figure 9, with a slightly below average voter turnout of 78%. 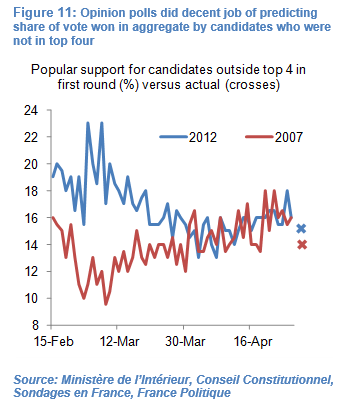 Mélenchon saw his popularity rise from about 8% in mid-February 2012 to 16% in early April 2012 and overtook Bayrou but he ended up winning only 11.1% (see Figure 9). Opinion polls predicted with a reasonably high degree of accuracy the share of the vote won in aggregate by candidates who were not in the top four, particularly in 2007 (see Figure 11). In the ten weeks to the 2012 and 2007 presidential elections, polls on average had these candidates winning 17% and 13.8% of the popular vote, respectively. These candidates ended up winning 15.2% and 13.9%, respectively. Opinion polls’ accuracy (in determining candidates’ ranking in the first round) typically diminishes in the lower half of the rankings as a small shift in popular support can easily take a candidate from say 10th to 8th place or vice versa. Polls held before the first round accurately predicted the eventual election winner in the 2012 and in particular 2007 elections (see Figures 12 and 13). Unsurprisingly perhaps, polls held after the first round (i.e. in the two weeks up to the second round) more accurately predicted the outcomes (see orange boxes in Figure 6). In particular the opinion polls held in the fortnight before the second round in 2007 on average had Sarkozy winning 53.2%. He won with 53.1% of the popular vote (see Figure 14). 3. WHAT ARE FRENCH OPINION POLLS CURRENTLY PREDICTING? The latest opinion polls have Le Pen and Macron neck and neck on about 25%, Fillon in third on below 20% and Mélenchon on about 15% (see Figure 2). However, these types of opinion polls for the first and second rounds have several potential shortcomings which may be more or less acute from one election to another (see Figure 16). History shows that when voter turnout has been low (2002) or below average (2012, 1995) the National Front and far left candidates have done well in the first round and broadly better than predicted by polls (see Figure 17). Conversely, centrist candidates have performed strongly when voter turnout has been high (1974, 1988 and 2007), as I detailed in The Ultimate Guide to the 2017 French Elections – Part I (7 March 2017). 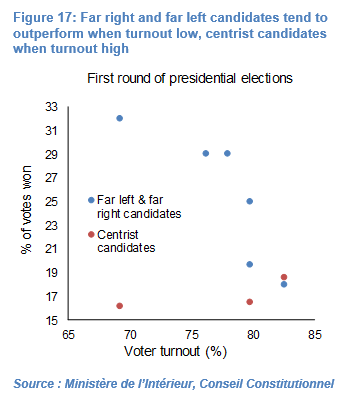 One explanation is that voters who occupy the political centre-ground may typically be less inclined to turn up and vote than those who are backing candidates on the far left or right of the political spectrum (i.e. they are less “politicized”). On this basis, a low turnout in the first round this year would potentially help Marine Le Pen and Mélenchon, while Macron would benefit from an above-average turnout. Recent polls suggest that a large share of registered voters are still undecided as to whether they will actually vote on 23rd April, which would in turn point to opinion polls perhaps under-estimating the share of votes which Le Pen will win while over-stating the share of votes which Macron will win. Those polled are asked to pick a candidate irrespective of whether they are still undecided and may vote blank on the day (i.e. not pick any candidate on the voting form). In previous elections the share of blank votes in the first round has been modest at about 2.5% of votes cast. But this ratio was about 3.4% in the 2002 presidential elections which saw Jean-Marie Le Pen beat expectations to make it to second round run-off. Recent polls suggest that the share of blank votes could be higher in this year’s first round, with voters using the blank vote to voice their discontent with the candidates. As per with voter turnout, the message is seemingly that a high share of blank votes would ultimately benefit candidates at the extremes of the political spectrum (i.e. Le Pen and Mélenchon). 3. Voters who may not be revealing their true voting intentions. Analysis following the 2002 and 2012 presidential elections suggested that polls had under-estimated support for Jean-Marie Le Pen and Marine Le Pen, respectively, because those polled had been unwilling to reveal their true voting intentions due to the potential stigma of supporting an extreme-right candidate (in particular Jean-Marie Le Pen). This argument has resurfaced, with the number of votes for Marine Le Pen in the first round expected to be greater than implied by opinion polls. However, it is not obvious that the stigma of voting for Marine Le Pen is particularly acute. First, she has significantly toned down the extreme-right rhetoric espoused by her father and made the party more acceptable to a mainstream audience (see Question 2 in The Ultimate Guide to the 2017 French Elections – Part II, 29 March 2017). Moreover, the victory of Donald Trump in the US presidential elections and the strong nationalist bias expressed in the UK referendum vote have arguably made it more acceptable to vote for a candidate or decision with strong nationalist undertones. What about the second round of the presidentials? While Marine Le Pen (and Mélenchon) may therefore perform better in the first round than suggested by current polls, the question is whether the above caveats are likely to invalidate opinion polls which currently show Macron convincingly beating Le Pen in the second round (see Figure 3). Past presidential (and regional) elections would suggest that they will not. Opinion polls correctly predicted, with a reasonably high degree of accuracy, the outcome of the second round of the past three prior elections, including the 2002 presidential elections (see above). In order for Le Pen to win the second round, current opinion polls would have to be over-estimating support for Macron by about 12 percentage points – equivalent to about 4.2 million voters based on a slightly-below-average turnout of 75% in the second round and 47 million registered voters. This would be a far larger-than-typical margin of error for a popular poll. It is not impossible but would be almost unprecedented. Comparisons with Donald Trump’s victory in the US presidential elections and “no vote” in the UK referendum on EU membership are tenuous in my view because both outcomes were within the margins of error associated with popular opinion polls. Trump’s standing in the polls steadily rose in the months up to the 8th November elections and he was only a few percentage points behind Democrat candidate Hillary Clinton in the last days of campaigning. In contrast, support for Marine Le Pen (in the second round) has stagnated at below 40% (see Figure 3). Similarly, polls in the weeks up to the UK referendum on 23rd June had the “yes” vote winning but by only a small, statistically insignificant margin of a few percentage points and it took a swing of only 3-4 percentage points for the “no” vote to win by a narrow 51.9% to 48.1%. The “no vote” was certainly never anywhere near 20 percentage points behind the “yes” vote. 4. DO REGIONAL ELECTIONS TELL US ANYTHING ABOUT CANDIDATES’ CHANCES? The first and final round of the French regional elections held on 6th and 13th December 2015 provide an interesting template of what may happen in this year’s presidential elections. The National Front party led by Marine Le Pen won 27.7% of the national vote in the first round of voting, ahead of all the other parties, including the Republican Party (26.6%) and Socialist Party (23.1%). It was top in 6 of the 13 super-regions, its best-ever showing in regional elections. Strong support for the National Front in the first round was a clear protest vote following recent terrorist attacks, with the electorate voicing its discontent with current policies on immigration and policing amongst others. In the second round, the National Front won a slightly smaller 27.3% of the national vote, which translated into only 18.7% of the regional seats up for grabs. It failed to win a single region, while the incumbent Socialist Party led by President Hollande won five regions and former President Sarkozy’s centre-right party won seven. Marine Le Pen won 42% of the vote in the Nord-Pas-de-Calais-Picardie region while the up-coming Marion Maréchal Le Pen – the niece of Marine Le Pen and grand-daughter of Jean-Marie Le Pen – won 45% of the votes in the Provence-Alpes-Cote-d’Azur region. But at a national level, the National Front was comprehensively beaten, due largely to the other mainstream parties forming tactical coalitions to keep it out of power. Effectively, the Socialist, Republican and centrist parties/candidates which had fought each other in the first round changed tact in the second round, giving their support explicitly (by forming pseudo-coalitions) or implicitly to other parties/candidate to secure victories for the centre ground and keep the National Front out of office. It is conceivable that, should Marine Le Pen and Macron make it to the second round, candidates from the other main parties will try to stop Le Pen becoming president by publicly backing Macron and urging their voter base to do the same. Manuel Valls, the former Prime Minister who was beaten in the Socialist Party primaries in January, has already done so. He publicly stated on 30th March that he was endorsing Macron, rather than the Socialist Party candidate Benoît Hamon, as Macron effectively stood a far better chance of winning the presidential elections and keeping Le Pen out of power. Francois Bayrou, the centrist who came third in the 2007 elections but is not running this year, has also backed Macron. 5. WHAT ARE THE ODDS OF A LEFT-WING CANDIDATE BECOMING PRESIDENT? The short answer is very small. Support for Mélenchon, the candidate of the far left France Insoumise movement, is grinding higher based on recent polls for the first round and recently hit 15%. This would mesh with the notion that voters at the extremes of the political scale may be more willing to express their support for their candidates (see above) and Mélenchon’s strong performance in the recent televised debate. However, at best he will come third ahead of Fillon. It is very unlikely in my view that he has the support to make the top two in the first round. Socialist Party candidate Hamon has slipped in the polls to fifth and his presidential election bid looks all but over. He has clearly been tainted by Socialist President Hollande’s weak presidency and more generally left-wing parties’ fall in popularity. Conseil Constitutionnel: A jurisdiction created in 1958 whose main task is to ensure that French laws are compatible with the Constitution. It is composed of nine members appointed by the President for a term of nine years. The current president is Laurent Fabius, a former Prime Minister and Minister of the Economy. President Pompidou died that year, during his first term in office. French law sets a blackout of the release of exit polls until the last polling station closes at 20:00 (local time). However, EU-based media outlets are not subject to the French blackout law and in 2012 reported early exit poll results before closure of the polls, in both rounds of the election.